Research in the UFZ thematic area of "Chemicals in the Environment" focuses on gaining a better understanding of the fate processes including transformation and biodegradation and effects of chemicals under real environmental conditions and on developing new concepts for evaluating environmental chemicals. The new technology platform CITEPro (Chemicals in the Environment Profiler) will now increase the capacity and efficiency of analysis and evaluation of chemicals and environmental samples. Above all, this will be made possible by automating processes in sample preparation, the exposure of cell cultures and aquatic organisms to individual substances, mixtures and samples from the environment and humans, and chemical analysis. With an international workshop on 6th February 2019, the UFZ will launch a research infrastructure that is unique in the field of environmental sciences in Germany. The German Federation, as well as the Federal States of Saxony and Saxony-Anhalt have invested a total of around EUR 4 million into creating CITEPro. The hazards of chemical substances to humans and the environment has been in the limelight for decades. Time and time again, individual substances become the focus of public debates or make the headlines. The current approach that is used to assess the hazard potential of chemicals is based on individual substances. However, the material world is shaped by chemical cocktails composed of large numbers of diverse molecules. Researchers therefore recommend that, where possible, the chemical analytical monitoring of water quality should be complemented by effect-based methods such as biological effect tests, for example. This would then cover all substances that act together in the cocktails. These bioassays are at the heart of the new CITEPro research platform. CITEPro is not a singular large-scale instrument. Instead, it comprises over 20 individual instruments that can be used in a modular manner depending on the question being studied. This includes units for sample preparation, in which chemical mixtures can be extracted, concentrated and purified from environmental samples (such as from sediment or blood). 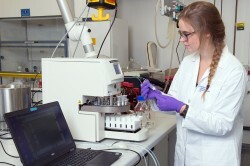 Furthermore, there are high-resolution analytical instruments that can be used to measure concentrations in environmental samples as well as in the bioassay multi-well plates themselves, and various bioassay methods for determining the effect of chemicals on living cells of mammals, bacteria and algae, or entire organisms such as fish embryos. The special feature of the bioassays used in CITEPro is that they can work with a very high throughput. In high-throughput mammalian cell bioassays, pipetting robots produce dilutions of chemicals, mixtures and environmental samples - as individual samples or alternatively as complex mixtures with a dispenser based on printer technology. 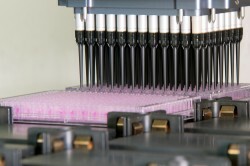 Since these steps take place in microtiter plates, the sample quantity required for these bioassays is significantly reduced compared to conventional methods. After transferring the diluted samples to the cells sown in the microtiter plates, the experiment is incubated for 24 hours. Using automatic image analysis of microscope photos taken at the beginning and end of exposure, the cytotoxicity of the chemicals can then be determined. In addition, substrates are added to the cells following the microscopy to quantify specific effects using a plate reader. "In future, we will therefore be able to analyse significantly more samples than before in the same timeframe, and thus also be involved in epidemiological studies and environmental-monitoring studies with a high spatial and temporal resolution. Through automation, we are also able to reduce the error rate and can carry out experiments more systematically," explains Prof. Beate Escher, the initiator of CITEPro. In a similarly efficient manner and as an alternative to animal testing, it is possible to test how chemicals affect fish embryos in CITEPro. Using VAST technology (Vertebrate Automated Screening Technology), it is possible to automatically analyse features in fish embryos. In doing so, the VAST system takes the embryos from a microplate and positions them in a capillary so that a camera can take high-resolution (fluorescence) images and videos as required. Using the FishInspector - open-source software developed at UFZ - image characteristics can then be extracted as numbers. This enables researchers to derive dose-response relationships. "These are only two examples but they demonstrate that CITEPro is far more than a collection of hardware devices. It is based on the concept of analysing substances in the environment not substance by substance, but rather mixture by mixture, in order to record and describe substance mixing activities," Beate Escher summarises once again. She also emphasises that "such infrastructure is unique in the field of environmental sciences in Germany, and is rare in Europe." She wants to use the new platform to initiate other research cooperations in the future - within the UFZ, nationally and internationally, with research institutes and industry. In the Helmholtz Centre for Environmental Research (UFZ), scientists conduct research into the causes and consequences of far-reaching environmental changes. Their areas of study cover water resources, ecosystems of the future, environmental technologies and biotechnologies, the effects of chemicals in the environment, modelling and social-scientific issues. The UFZ employs more than 1,100 staff at its sites in Leipzig, Halle and Magdeburg. It is funded by the Federal Government, Saxony and Saxony-Anhalt. The Helmholtz Association contributes to solving major challenges facing society, science and the economy with top scientific achievements in six research fields: Energy; Earth and Environment; Health; Key Technologies; Matter; and Aeronautics, Space and Transport. With some 39,000 employees in 19 research centres, the Helmholtz Association is Germany’s largest scientific organisation.